I would like to be a child prodigy, but I'm too old. This is not to say I wasn't a gifted child, my gifts were just smaller than others and I hid them well. I hid them because I was gifted enough to realize that if you let people know you were smarter than you looked you quickly became a target for the other even less gifted children. I suppose it is okay that I wasn't overly gifted. Because there is nothing sadder than an adult child prodigy. They are like those grown up child stars that no one likes any more because they stopped being cute. It's not that child prodigies stop being smart, they just generally grow into their smartness and thus become ordinairy smart adults whose emotional growth was stunted because they were child prodigies. That is seldom a pretty sight. I had a former child prodigy as a teacher when I was in 8th grade accelerated math (which I sucked at). He had got his math degree when he was about 16 years old and for some reason ended up teaching at a junior high when he was about 22. He was one of the most immature adults I'd ever encountered and we tortured him unmercifully for it (which brought him to the verge of tears while standing at the front of the classroom on more than one occasion) . He quit after one year. It was just as well, because he may have been brilliant at math, but he had no idea how to convey complex concepts to eight graders. I think the trick for child prodigies is to die young like Mozart to avoid the post-prodigy depression. There. 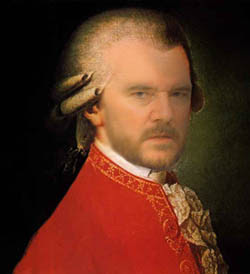 I just justified Photoshopping my face on Amadeus Mozart. I'm more gifted than I suspected. I was a gifted child too, only I burned out at 16 and have been going downhill ever since. Thank Bob I hadn't gotten a doctorate in anything, for now I'd be sitting here staring at a fancy parchment contemplating suicide. If it is any consolation, I still think of you as a gifted child. I wasn't a gifted child. But, Lights tells me that I'm pretty autistic. He's full of compliments like that. I never thought about what happens to child prodigies when they grew up. I always assumed they would be exceptionally successful as adults as well. Shows what I know. I've got a child who is the opposite of a child prodigy. He seems to be near retarded at everything other than social skills. Remember the marshmallows? I think perhaps "justified" is too strong a word for what you accomplished in this post. Speaking of Elton John lyrics, was he, "justified when [he] was five"? Another child prodigy! You start looking around and you find them everywhere! Shandi, For a man of bodadacious tatas, Lights shouldn't be pointing fingers. But I've seen your paintings and think you are extremely autistic. Marshmallows or not, you son still sounds like he will be a successful business person. That's better than ending up a washed up prodigy. Funny, I don't recall talking about Elton John lyrics. I think you are thinking of THE Michael. My daughter was gifted not really a prodigy but smart as hell. She talked at 6 months, by 2 she could read and write. When she was in kindergarten then wanted to skip her ahead and I refused to allow it. Now she seems on the same level as everyone else. I guess I retarded her growth by keeping her in her grade. Although she can play the piano by ear, we tried lessons this year so she would know the basics and she HATED IT with a passion! Man, for being a genius your old math teacher sure was dumb. He should have taught in High School. Being 22 all the geeky girls would totally have a crush on him - he'd never have a shortage of teacher's assistants.